Realtors in Keerbergen, Belgium, selling residences in a new apartment building will have an extra perk to market, especially to occupants of the top floors. Light. Lots of light. Especially after dark. The architect of the building consulted municipal authorities in Keerbergen two years ago to have a streetlight relocated from the site of the new building. But the city has dragged its feet, and so the architect (who wants to remain anonymous) was forced into a creative solution. 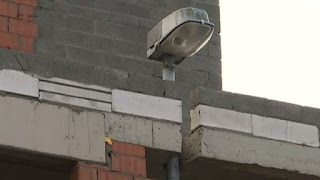 As his building started to rise, he decided to build around the streetlight. Photos show that the masonry on the facade of the building has been “notched” to allow for the presence of the light. "We could not wait, the administrative sluggishness of the municipality in this case has been shocking,” the anonymous architect explained. He promises, though, that the strange solution will only be temporary. As soon as the streetlight is moved, he’ll have his contractor go back and fix the “notch”. For the moment, though, it looks pretty strange. Christmas is a time that we “build around” things in our lives. Traditions, habits, unexpected events, celebrations, obligations; at Christmas we adapt our lives to them all. It’s just a given that we have to do decorating and shopping, that we’ll get together with friends, family, and colleagues at various times, that we’ll have to do some cooking or cleaning or traveling that we don’t normally do. It isn’t always convenient. Sometimes we don’t even enjoy all of it. But it’s all a part of life this time of year, and so we adjust our calendars, budgets, and attitudes accordingly. After all: Christmas will be gone soon enough. It will pass to memory and things will get back to normal. At least until next year, when we’ll build around Christmas again. It might be awkward and strange, but it’s just temporary. Of course, Mary never had that illusion, did she? Her life changed forever because of what happened two thousand years ago. Pregnant out of wedlock, married to a man who knew he wasn’t the father of her baby, chosen to give birth to the long-awaited king of Israel. “You who are highly favored,” the angel had called her. And maybe she was highly favored, but it probably didn’t quite feel that way from the jump. “He has brought down rulers from their thrones / but has lifted up the humble,” she would say. “He has filled the hungry with good things / but has sent the rich away empty.” And, of course, that’s great news for the humble and hungry. For the rulers, for the wealthy, it’s terrible news. Not something that’s easy for them to build around. That first Christmas, for Mary, wasn’t something easily built around. Jesus, for her, was a beginning of course. But he was also an end to the ease and comfort of believing that she could live a life that was ordinary and inconsequential to all except those closest to her. Her son wasn’t just a baby. He was a Savior, and he was a sign, and his life and death would change the world but would pierce her like a sword too. No way he would fit neatly into whatever life she may have envisioned for herself. Amazingly, she still called herself the Lord’s servant. “May your word to me be fulfilled,” that’s what she said. The same with Joseph. The same with the disciples a few years later, hiding in a top floor apartment when their crucified teacher was suddenly standing in front of them saying something about sending them as he had been sent. With the other disciple a few years after that, picking himself up off the road to Damascus to go stumbling blindly to the house of someone who might be able to help him make sense of what Jesus had said. They knew their lives would never be the same again, would never belong only to them again. There wasn’t a minor alteration they could make in the facade of their lives to accommodate what God was doing by sending Jesus to them. They would have to tear down everything and rebuild on him. On the other hand, Herod knew that too. He knew he couldn’t build around this newborn king. But he tried to uproot him. Same with the Pharisees, the scribes, the religious establishment. If he was who he said he was and if what he said was true, they couldn’t make him fit neatly. That’s why they conspired to get rid of him. It really wasn’t surprising at all given the things he did and said. Sometimes, folks meet Jesus and want to change their lives for him. Others want to marginalize him, hold him at arm’s length, or incorporate some version of him into their lives as they already are. And some will believe they can just do away with him. It’s funny: hardly anyone in our world has a problem with non-specific “religion.” Even a semi-private, polite, intellectual faith is unlikely to raise many eyebrows, to say nothing of voices. But the more specific you get about Jesus in our world, the more likely someone is to get hostile, to take offense, to do what they can to marginalize you and your faith. And you have to wonder if maybe that reaction to Jesus comes from some consciousness that he’s never content for a person to just build around him. All these centuries later, he’s still “a sign to be spoken against, so that the thoughts of many hearts will be revealed.” If you don’t cherry-pick what he says and does, he is intentionally polarizing. Take him seriously, and you’ll either tear down your life and rebuild it on him or you’ll push him away completely. It’s also funny that even people who check the “Christian” box on a form, some who are even found in church on a semi-regular to regular basis, have in reality just sort of decided to build around him. Or, at least, around an idea of him. Just like anyone else, we can tell ourselves — and even really believe — that with just a minor surface adjustment to our lives he’ll fit neatly, with very little effect on what’s behind the facade. Examples could be multiplied, but you don’t need them. You know it’s true. If you’re like me, you know it from experience. And what I hope we can be reminded of by the familiar Christmas story this year is that it doesn’t really work that way. The One who came from the “overshadowing” of God into human life can’t be expected to stay in the shadows himself. The one who inverts the values of our world like he does can’t be expected to leave our own values untouched. The one who comes so that the thoughts of many will be revealed can’t be expected to leave our own thoughts shrouded. And if he is a sword that pierces hearts, why would we expect our hearts to be left alone? If you’re trying to build your life around Jesus, the way we all try to make room for Christmas traditions this time of year, you’re going to be frustrated. Don’t just make room in your life for him for the moment. He wants to dismantle your life and build it on him. May we, too, be the Lord’s servants.